For deep ice pick scars, try our 2 mm dermastamp (not a dermaroller). First do a test patch. Stamp the same small area of scars densely (every four weeks) to see how it reacts. If everything is OK, start stamping all scars every four weeks. If you have too many scars to do them all thoroughly and densely during one session, spread it out to several sessions. First stamp scars on one cheek, when it heals do the other cheek and so on. The single needle should not be used more frequently than at most once every three weeks (preferably four weeks) on the same skin area. You can use it however in the same session as the dermastamp. First needle the scars and then stamp them. If the session is really aggressive, repeat it after five weeks. No, sulfur cream cannot replace Tretinoin (A-Ret). You can use the sulfur cream but not in the place of Tretinoin. Tretinoin helps keeping acne under control and it also helps a lot to diminish post-acne spots. As soon as the spots are gone, you can stop applying Tretinoin, provided you manage to control your acne in a different way to prevent new spots. It occasionally happens with a very small percentage of OwnDoc dermarollers that one can get a little "stuck". This is caused by the top of one of the roller arms catching on one of the little holes near the edges of the side of the roller head. It causes the roller not to roll smoothly, or even "stick". This is not dangerous but of course inconvenient when it happens. When this happens with your roller, let us know and we'll immediately send you two replacements without the need to send back the old one. We always ship our replacement products tracked. If your order has been placed less than 90 days ago, we can also refund you and send you a replacement, if you prefer. Meanwhile, you can either temporarily or usually even permanently fix the problem by slightly bending the white plastic arms apart. Half a millimeter is enough. First soften the plastic by moving both arms around for half a minute under very hot tap water. Don't worry - this won't blunt the needles. Make sure you heat up the arms well, from their very base to their very end. Then, if you have strong finger nails, pull the arms apart with quite some force. Be careful that you don't pull so hard that the roller head comes out, because it's a pain to get it back in again. If you don't have strong finger nails you'll have to improvise with a thin metal ruler and strong tweezers or needle nose pliers for example. Excert the force at the end of the arms, not where they come out from the handle. We apologize in advance if you will encounter this problem. The problem is rare but it does happen sometimes. The roller itself is of excellent quality but the problem is caused by the fact that some of the roller head protection caps have been pushed on too tightly, and in the summer heat this has caused some roller arms to be pushed inwards for a fraction of a millimeter. We are working on preventing this problem. Can't get a stuck roller unstuck? Let us know and we'll send you TWO replacements! The difference between mask and serum is explained in the detailed sales descriptions in the store. Product volume, basically. And the mask is a facial mask and the serum is not. If you have any questions after reading the materials, let me know. Start with a 0.5 mm regular dermaroller and roll once or twice a week. Dermaneedling tools will eventually get blunt so you can always go for a longer size next time when you are already experienced. The spots may improve a lot relatively soon and you may not need any further/longer dermaroller. I really think you should try our lowest percentage Tretinoin cream (0.025%) and apply it about three times a week (not after dermarolling). If the skin gets too irritated, apply it only twice or even once a week. Some mild redness and irritation is normal, especially initially. Actually, to improve your post acne spots, you do not need vit. C serum. Dermarolling / Microneedling / Re: Using 1.5 mm stamp. Should I be rolling too? Adding hydroquinone seems a good idea. Yes, you can buy a regular 0.5 mm dermaroller and use it (amongst other) to enhance the absorption of hydroquinone. I suggest buying our 0.05% Tretinoin cream (A-Ret) and applying it about three times a week on your forehead. 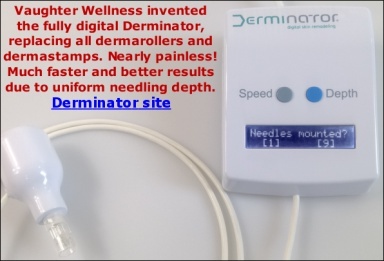 I also recommend adding a 1.5 mm dermastamp with 35 needles to your 1.5 mm dermarolling session. During the same session, stamp the scars, and then roll the entire forehead. Your type of scars very often improves with microneedling, so you are lucky! Would it be possible for you to post a photo here here or email me a photo? Are you getting hypopigmented spots? The first pic is after the first session, the second pic is after the third session. It has been two months as of the 15th September... I will continue every 3 weeks... They are taken under bright lights in the same room with iPhone camera .. I am glad to hear your wrinkles softened. You do not have to avoid the sun or wear a hat all the time. The little sun exposure you describe should normally not result in hyperpigmentation. You may be an exception but I doubt it. In some unfortunate individuals who are very prone to pigmentations, the skin may react to microneedling by producing more melanin pigment (even without sun exposure). The pigmentation will eventually go away. So far I have only heard about this happening after very aggressive needling of stretch marks with size 1.5 mm or longer. However, there are individuals whose skin reacts by melanin production to the tiniest skin injury – a bug bite, a pimple, an ingrown hair etc. If you live in very sunny climate and spend lots of time outside, it is wiser to stop using A-Ret in summer unless you use it for a purpose that should not be interrupted, such as keeping acne under control. If you are very prone to hyperpigmentation, it may be better to avoid rolling and stamping the face in summer. I'm sorry - if your suction pump broke, we will replace it. We always replace faulty products. Please email martina at owndoc dot com. The suction pump is mainly for the rolling type of acne scars (they are often tethered) and it is worth trying for other type of scars if the scars resisted improving after all other treatments for a long time. But bruises look terrible and of course you don't want to walk around with a bruised face, especially not when you're living with someone.. I am happy to hear the oil cleansing method is working for you. Dermarolling or stamping also helps cleaning pores. Are your scars getting a little improved after stamping? I had a terrible flu and I'm still not completely OK after 5 weeks, sorry for the delay..
A 1.5 mm dermastamp instead of a one-liner roller would be more suitable in your case but you can use a one liner as well. If you have just a few stretch marks, treat them all in one session (every 4-5 weeks). First, use the one liner roller on each individual stretch mark: Roll each stretch mark very densely (at least 10 times). After you will have rolled all of them with the one liner, roll the entire area with your regular 1.5 mm dermaroller. If you have too many stretch marks to treat them thoroughly and densely in a single session, you have to spread it out over multiple treatments. In this case you should do it the other way round. First, roll the entire area with your regular 1.5 mm dermaroller (every 4-5 weeks). When the redness is gone (in a few days) and you can see clearly the individual stretch marks, roll each individual stretch mark densely (at least 10 times) with the one liner roller. Roll every day (or so) a few stretch marks, until they are all done. The reason I introduced this "spread out" treatment is that I recommend combining stamping/needling and rolling. Needling and stamping is very laborious and it must be done thoroughly and densely. Nearly noone has the time to do all stretch marks in one session. Dermarolling / Microneedling / Re: Is a 2.0mm Dermastamp dangerous?